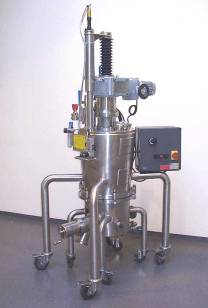 The RoLab Filter is an easy to operate and highly portable nutsche filter designed for the filtration and drying of small pharmaceutical and chemical batches. It is a manual solution for both laboratory and production environments that provides all the process functionality of the traditional Rosenmund filters at a fraction of the cost. The RoLab is suitable for CIP and WIP and performs full filtration and drying processes according to cGMP and FDA standards. The vessel uses no hydraulics; thus, avoiding complicated installations and maintenance. The lower bowl assembly can simply be wheeled out from underneath the upper part to allow for easy cleaning between batches. With only five connections required for set up (460VAC, pressure/vacuum, nitrogen, slurry inlet, heating/cooling utilities), the RoLab’s basic installation is easy to perform. Its compact design can be installed in very small areas.